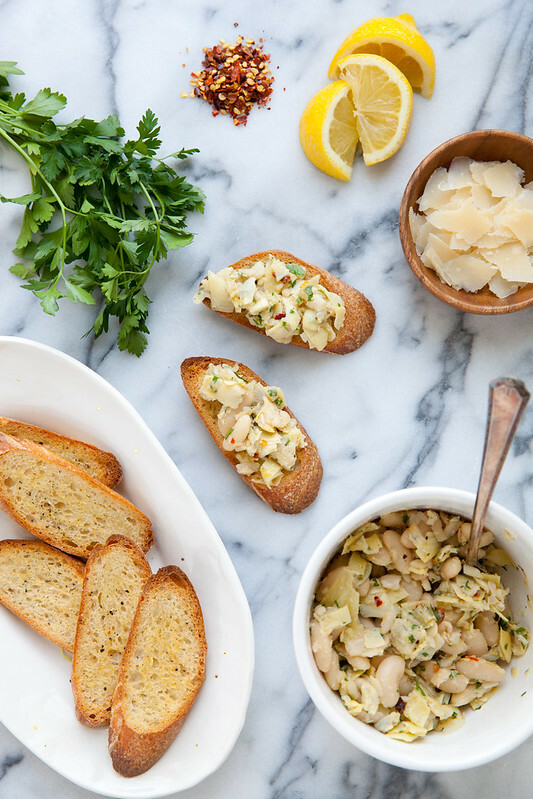 Not to brag or anything, but my crostini game has been crazy strong lately. I credit the spring weather for this welcome wave of inspiration. These warm and breezy spring days beg for light, casual dinners meant to be enjoyed with a glass of chilled white wine (or your favorite seasonal sip.) This particular rendition was inspired by a dish I enjoyed last spring while exploring NYC with two of my favorite ladies. We hit up Eataly, sidled up to the first open table we found, and somewhat randomly ordered several items off of the menu in our awestruck state. The wine was fantastic, the food was even better – so good it wasn’t even ruined by the cool dude next to us loudly berating an airline customer service rep over the phone, and threatening to trash them to his “10,000 Facebook friends”. Klassy. Anyway, I recently remembered that lovely dish due to my crostini kick, and decided to make a similar version at home. It turned out beautifully. Such simple ingredients but the combination works so well all together. This works as either an appetizer or a “snacky dinner” as we call them in our house, and those sorts of dinners often turn out to be some of our favorites. In a medium bowl, combine the olive oil, lemon zest and juice, parsley, red pepper flakes, parmesan, artichoke hearts and beans. Mix gently to combine. Season to taste with salt and pepper. Cover and set aside to let the flavors meld. Preheat the oven to 450˚ F. Lay the baguette slices out on a baking sheet and brush lightly with olive oil. Season lightly with salt and pepper. Bake until the crostini are just browned and crisp, about 7-10 minutes. Once removed from the oven, rub the browned side of each baguette slice with the cut half of the garlic clove. 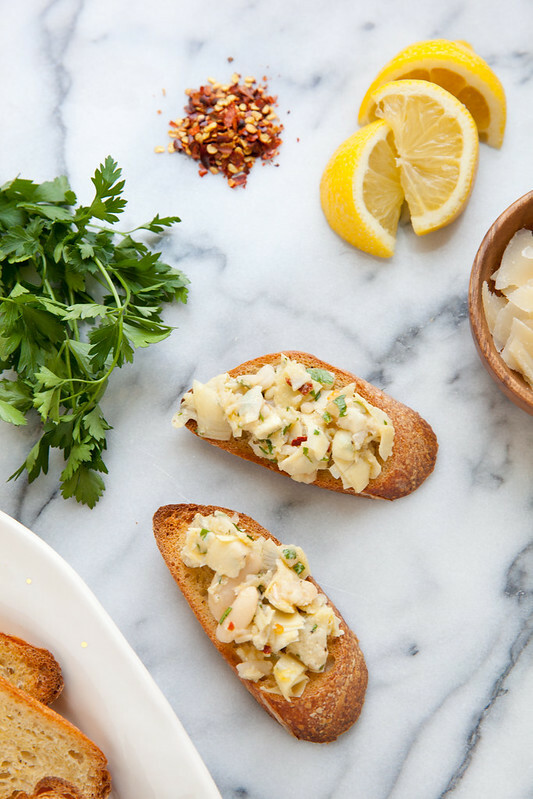 Top each piece of bread with a spoonful of the bean-artichoke mixture and garnish with additional shaved parmesan, if desired. Serve.